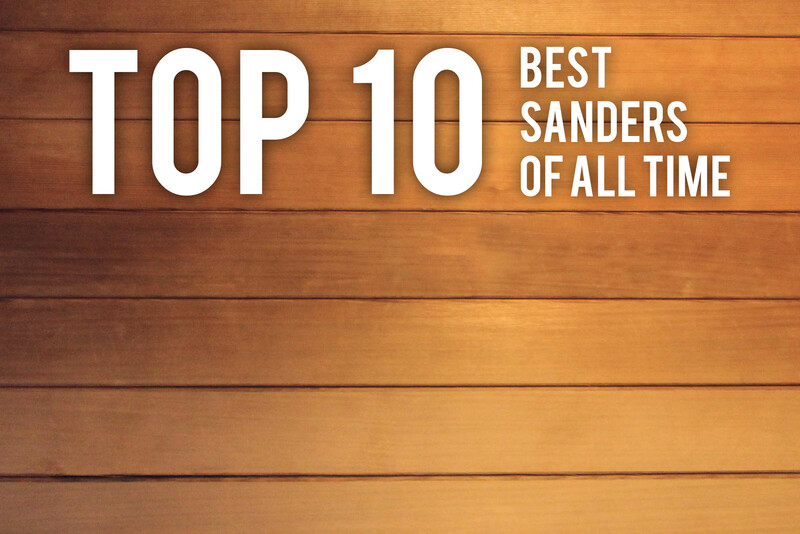 Find out what the Top 10 Best Sanders of All Time are. Read their in-depth reviews and my honest opinion on why they are the very best you can get. Best Belt and Disc Sander Reviews Belt and disc sanders are popular due to the practicality and competitive pricing they bring Read more. Best Belt Sander Reviews Belt sanders are a great choice if you want a powerful, multi-use sander that can handle Read more. Best Cordless Sanders Due to your frequent questions and a lot of requests, I’ve decided to write this article to Read more. Best Detail Sanders Often overlooked but extremely useful, detail sanders bring a level of quality to your sanding work that Read more. Best Disc Sanders for Sale Today Disc sanders are extremely useful sanding machines that can make some woodworking tasks a walk Read more. Best Drum Sanders For Sale Let me say this first – drum sanders are my absolute favorite sanding machines. I’ve Read more. Best Dust Collectors Dust collectors are easily one of the most essential machines in any woodworker’s shop. Even with high Read more. Best Edge Sander Reviews Edge sanders are powerful machines that focus and excel on one thing: Versatility. Out of all Read more. Best Palm Sanders Palm sanders are small and very lightweight sanding machines that you can control using, as the name Read more. Best Random Orbital Sanders Random orbital sanders are in my top 3 of the absolute best sanding machine types you Read more. Best Sanders for Deck Refinishing Wooden decks are among the most popular sanding pieces in the world. This is due Read more. Often detailed and with tight, confined interiors, cabinets are a challenging sanding task and to ensure that you ace them Read more. Door sanding can be difficult. From panel ornaments to windows and other intricate details that get in the way of Read more. Floor sanding is a long, hard task and if you don’t have the proper machines for it you’ll not only Read more. When it comes to the tight corners and right-angles that make stairs an infamously pesky sanding task, you need the Read more. Sanding walls of any type requires a machine that is both powerful and fast. Powerful to easily get rid of Read more. After writing the top rated sanders article, which presents an overall “winner” for every single type of sander, a lot Read more. Best Sanders for Furniture Refinishing A lot of people ask me what the best sanders for furniture are, to which Read more. Paint removal is a tricky business that can give you a few headaches and, without the proper tools, disappointing results. Read more. Best Sheet Sanders Sheet sanders are small, lightweight machines that you can move around comfortably. They are similar to the Read more. Effective and extremely handy, portable air filters allow you to clear the air of any room you want in an Read more. Best Spindle Sanders Spindle sanders (also called oscillating spindle sanders) are the unrivaled top pick for dealing with curves. When Read more. Having a clean, dust-free work space is an essential part of any woodworker’s life and with these cheap dust collectors Read more. While a lot of the so called “budget” tools are often sub-part and disappointing, some of them manage to blow Read more. Indispensable to any home and easy to use a sander is a simple power tool, commonly used in woodworking and in some cases metal, to clean, smooth and polish a selected surface. It can bring old furniture back to life and make them look brand new, I even say better than ever. Sanders are available in a multitude of sizes, power and shapes that adapt to any situation but one thing they all share is that all of them, as the name implies, use sand paper. The sand paper used by the machines also comes in various shapes and sizes in order to fit the different sander types and they also vary in how abrasive they are, their grit – it can be finer (higher) or rougher (lower) and their usage depends on the particular job you’re trying to accomplish. Choosing a sander can be tricky due to the massive amount of different types, brands and power of these machines. I’m here to make this tedious and long process as quick and easy as possible, not only to ensure you make the right choice but that you also get the best deal possible. There are a few things to consider before buying a sander. First of all, what do you need it for? Is it a big surface like a wooden floor, medium like a table or small such as a chair or little wooden pieces? Remember to also consider the shape of the objects as well as some sanders are better for curves and round shapes. Power is also very important as some sanders might cave when faced against harder tasks while more potent ones will be able to take them on. Then, the frequency of use. Will sanding be an occasional event for you, to use when you need to make an old object brand new for example or will you use the sander very often, such as professionally or for a woodworking hobby? Finally, the available space. Are you short on space and need a compact, easy to store solution or do you have your very own shop or garage that can hold a big and powerful machine like a benchtop sander? These are the 3 essential questions you should ask yourself before buying a sander, it will make sure you know exactly what you need to satisfy your needs. This type of sander uses a sandpaper belt that continuously loops around the base of the sander. It can be handheld or stationary, the latter being usually accompanied on a workbench with a disc sander as well. A popular, powerful and well rounded choice. Disc sanders are usually stationary, although you can also find a few reliable handheld machines. They use round, circular shaped sand paper that is attached to a turning wheel. They are great for hard, coarse grit sanding and are also used very much for metal surfaces. The sheet sanders are handheld machines that use square or rectangular shaped sandpaper that very quickly and repeatedly moves back and forth or vibrates in order to sand a surface. They are usually quite light and versatile, being able to deliver great results with smaller objects and also a bit larger surfaces such as tables. These machines, also called random orbital sanders, are handheld sanders that vibrate in circles (hence the name orbit), the random variety also spins at the same time. This random orbital fashion is used in an effort to reduce marks and noticeable patterns on the surfaces to ensure the best possible result and finish. It uses disk shaped sandpaper that as I’ve mentioned above both moves and spins to create its famous orbital movement. Spindle sanders, also called oscillating spindle sanders, are the very best when it comes to curve sanding. Simple and effective, this type of sander consists of a tabletop with a protruding sanding drum that not only spins but also moves up and down (oscillates) to ensure the best possible results on curved surfaces. While it takes up a little bit of space it is a must-have if you need to work with curves and it’s also incredibly useful for a few long surfaces like wooden beams. I have to admit, these are my favorite sanders. Drum sanders are extremely powerful and effective sanding machines that are mostly used for large surfaces. The machines themselves are quite big but very easy to use – you simply insert the piece of wood on the front, it goes through the rotating sanding drums and it comes absolutely clean and smooth on the other side. They save you a whole lot of time and effort, impeccably sanding the pieces almost automatically. Perfect. Not for any specific task such as the others, it simply means a sander that you can use by placing a single hand on top of it. They are compact and usually very lightweight. A good choice for small and simple tasks. These are sheet sanders that have a triangle shape on the front in order to sand hard to reach places. They are also called mouse sanders and are very light and small, although incredibly useful. These are inexpensive and can bring another level of professionalism and detail to your pieces. As the name suggests, it’s a larger machine that offers both a belt and a disc sander solution. A very popular choice due to its practicality and very competitive prices. You’ll often hear me say that Powermatic stays true to their slogan – “the golden standard” – in every single machine they have. They deliver, in my opinion, some of the very best sanders in the market in every possible way - tank-like durability, monstrous power, first-rate performance, advanced features and a mind-blowing attention to detail. The praise from the crafts community is well-deserved. I enjoy Porter-Cable tools immensely, they even produced the Speed-Bloc which is my all-time favorite palm sander. They have great and innovative ideas that come to life in the shape of high-quality and sturdy tools at surprisingly attractive price points. One of the more mainstream brands of power tools, Black & Decker puts out good products at very decent prices. While they rarely deliver a sander that truly impresses me, they are always solid and very easy to use. Not to be confused with Powermatic, Powertec tools are very inexpensive machines that can sometimes lack a bit of quality and attention to detail but still deliver decent results. While using a sander is pretty straightforward, there are a few key points and nuances that you should get to know and apply for the best results and maximum safety. First of all, always use the required safety equipment – a pair of safety glasses and a dust mask, I’ll go more in depth about this below but it’s always a good idea to protect your eyes and lungs whenever you get to work. I usually sand for quite a lot of time so I also use protective ear muffs or noise cancelling ear buds to avoid the terrible headaches that come with hours of loud noise. Now that you’re ready, in most cases you need to attach your sandpaper piece to your sander. Different machines have different ways to attach and lock the sandpaper in place. Sheet sanders usually have some sort of clasp where you simply bend the sandpaper below it and then lock it in place. Orbital sanding machines are even easier to ready up since they use Velcro to hold on to the paper. Some machines are different like a belt sander for example, often times they have a lever that you pull in order to relieve the tension pressing the belt down to be able to install a new one. Each machine is different so although they often share the same mechanisms I recommend that you read their leaflet before using them. When you start up your sander and get to work it is very hard to resist not pressing the machine hard against the surfaces. I know this feeling, and I know it’s just great to see the surface getting nice and clean so quickly but you have to resist doing this. By pressing the sander with too much force you’ll actually start leaving scratches and dents on the surface, some are noticeable right away and others only when you apply varnish but they are both easy to avoid. Just remember – slow and steady wins the race. A universal sanding rule is to always sand with the grain (when working on wood). Sanding against the grain will rip out the wood fibers and leave a nasty end result while sanding with the grain ensures a clean and smooth finish. Finally, remember to keep the surface clean! This is simple but so many people forget it, I’ve seen my co-workers take much longer and getting bad results due to not regularly cleaning their objects. Sanders work by abrasion, which needs full contact for it to work properly. By not cleaning often, you’ll leave dust and bits of wood or metal behind that, even if you don’t notice, will get in between your sander and the surface. Keep it clean for the best outcome. Before any work with a sander I heavily recommend that you equip a pair of safety glasses and a dust mask to prevent any problems with flying debris and breathing in dust. You might not think this is required but trust me, I’ve been there and I guarantee that it’s not a pleasant experience! Imagine for example that you’re sanding a surface covered in led paint, without protection you would put yourself in real danger by breathing in the dust, this also applies to any kind of paint. Equipment that you have around the house will do the job just fine but if you don’t have any, I recommend these glasses and this mask – very cheap and sturdy. For the noise cancelling aspect, that I see as essential, I use these. For each sander there are various parts and accessories that you can purchase to either upgrade the machine, add a new feature (thinner or larger sanding drums for example) or to replace a worn out part, like sanding pads (the part that holds the paper) instead of buying a whole new machine. The thing you’ll be buying and using the most is of course, the sanding paper. You can get these in sheets of your desired shape and of different grits as I’ve talked above. Similar to the machines themselves, sand paper is available from a multitude of different brands. Throughout the years I’ve grown fond of a few for their performance and outstanding durability, which is a common problem among quite a few brands of sand paper. I’ve listed them to help you choose the very best, be sure to check them out here. Sanding and woodworking is and always has been a passion of mine as it was my father’s as well. Working together with him since a little kid and seeing him turn old and seemingly useless furniture into what seemed like brand new things always put a smile on my face. I want to share my expertise on this subject and I truly wish you not only learn more about this fine craft but that you also enjoy doing so. I put this website together to be able to help you as best as I can and as such I am also available to answer any questions you have, simply leave a comment down below and I promise I’ll give my all to answer it. Thank you for reading and make sure to check out the other articles!